, a French historian, of an ancient family, was born at Bourdeaux about 1535. He went to court at twenty years of age, and in 1556 and 1557 was secretary to Francis de Noailles, bishop of Acqs, in his embassies to England and Venice. After that, his first appearance in the republic of letters was in the quality of a poet and translator. In 1559, he published a poem, entitled “The Union of the Princes, by the Marriages of Philip King of Spain and the Lady Elizabeth of France, and of Philibert Emanuel Duke of Savoy, and the Lady Margaret of France;” and another entitled “The Tomb of the most Christian King Henry II.” In 1560 he published an abridged translation of “Tully’s Offices, 7 ’ and of” Eutropius’s Roman History;“and, in 1568, of” The Life of JEmilius Probus.“He applied himself afterwards to the writing of history, and succeeded so well, that by his first performances of this nature, he obtained of Charles IX. the title of Historiographer of France 1571. He had published the year before at Paris a book entitled” Of the State and Success of the Affairs of France;“which was reckoned very curious, and was often reprinted. He augmented it in several successive editions, and dedicated it to Henry IV. in 1594: the best editions of it are those of Paris 1609 and 1613, in 8vo. He had published also the same year a work entitled” Of the Fortune and Power of France, with a Summary Discourse on the Design of a History of France:“though Niceron suspects that this may be the same with” The Promise and Design of the History of France," which he published in 1571, in order to let Charles IX. 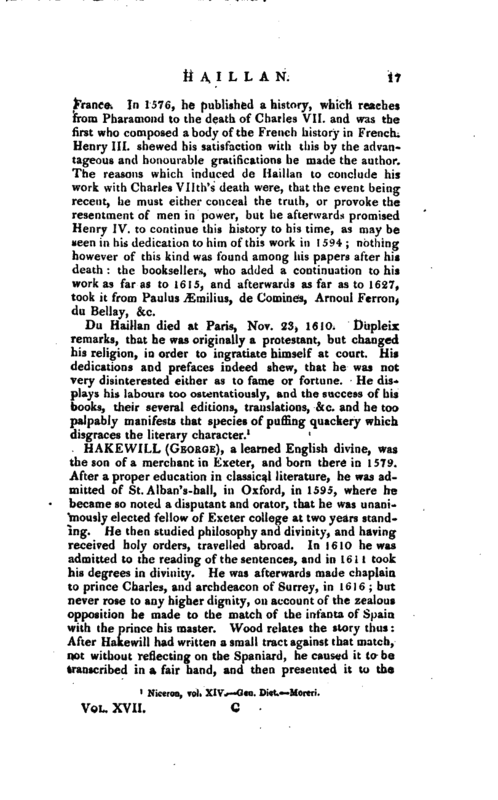 see what he might expect from him in support of the great honour he had conferred of historiographer of | France. In 1576, he published a history, which reaches from Phararnond to the death of Charles VII. 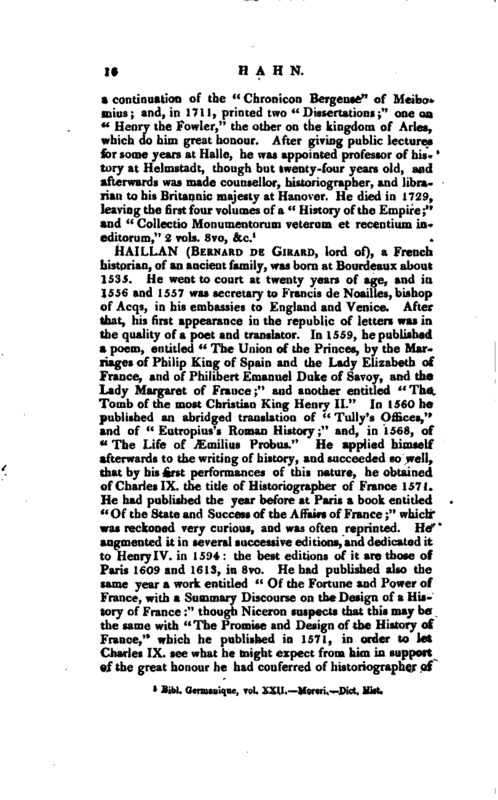 and was the first who composed a body of the French history in French. Henry III. shewed his satisfaction with this by the advantageous and honourable gratifications he made the author. The reasons which induced de Haillan to conclude his work with Charles Vllth’s death were, that the event beingrecent, he must eitlier conceal the truth, or provoke the resentment of men in power, but he afterwards promised Henry IV. to continue this history to his time, as may be seen in his dedication to him of this work in 1594; nothing however of this kind was found among his papers after his death: the booksellers, who added a continuation to his work as far as to 1615, and afterwards as far as to 1627, took it from Paulus Æmilius, de Comines, Arnoul Ferron, du Bellay, &c.
Niceron, vol. XIV. Gen. Dict. —Moreri.